Of all Disney’s creations, Fantasia (1940) stands out like a sore thumb. Not only does it stand on a highly regarded precipice for its unique creativity and imagination, it hurt Disney’s accounts department with the pictures profoundly disappointing losses. It was ambitious, expensive and tackled cinematic themes like no other motion picture had before. The original idea was to create a selection of animated sequences, set to classical music, without a script or traditional storytelling. The name came from the classical term for a free-form, fanciful composition, which led to the simple yet apt name of Fantasia. As Nunoda highlights, “[The] absence of speech means the movement becomes the films primary means of projecting emotion.” This absence makes way for the favouring of motion and cinematic composition to keep the audience on the edge of their seats but also it allows the fundamental essence of the film, the classical film score, to be brought to life through animated images. The film successfully merged both high and low cultures. The use of classical music, of which many pieces were hundreds of years old, combined with the relatively new media form of animation was hugely significant. It resulted in bringing animation, a form of low-culture to a level of respectability that the films predecessors Snow White and the Seven Dwarfs (1937) and Pinocchio (1940) had not quite achieved. The motion picture was a melting pot of bold ideas in a time of political and social upheaval throughout the world. On paper, the film may have suggested little appeal and in practise this prediction may have been correct- the box office takings were a third of the overall budget. However, the boundaries surrounding cinema to date were tumbled by this film. The use of film scores, characters and even the flow (or complete lack) of a continuous narrative completely threw open endless possibilities the medium could inspire. It is also interesting to note that the individual taking centre stage for this production was not a big Hollywood actor but of course a little chap called Mickey Mouse. 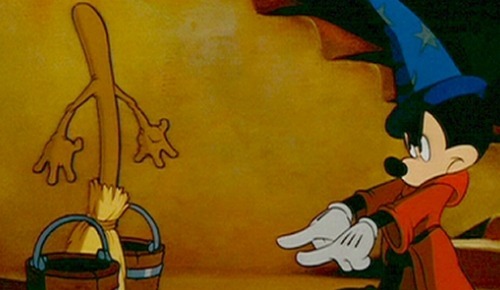 The film was responsible for re-inventing Disney’s out-of-sorts character, which was still their first and most profitable invention. Ultimately, Fantasia is neither a conventional musical nor an experimental vanity project. It is the ultimate American populist work in that uses elements of fantasy to strip away the pretentions of classical music, and in doing so, elevates two supposed “low forms” to the echelon of artistic significance. Tags: animation, Disney, Fantasia, IQ magazine. Bookmark the permalink.